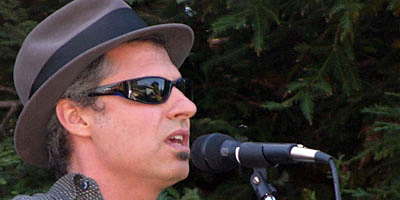 The original music penned by Dale Henry Geist has been called folk poetry with a rock ‘n ‘roll heart. “It’s been called that by me, actually,” says Dale. “It’s reasonable shorthand, but you should listen for yourself, and call it what you want.” A San Francisco Bay Area denizen for over twenty years, Dale currently lives in Kenwood, CA with his wife, Laura, their son, and a bunch of animals. 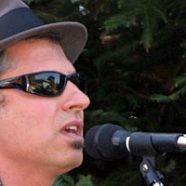 As a fairly thoughtful and articulate guy, how do you bring those qualities to bear in how you approach songwriting? Er… I don’t think I do, actually. I approach songwriting kind of like this: some kind of germ of an idea comes to me either as a line or a melody or a riff, and I try to run with it as far down the field as possible before I run out of steam. Steam being maybe the original inspiration. If I’m lucky, I get far enough to have something that’s legitimate. I try to bring my whole toolkit to bear on a song, everything from logic to intuition to randomness, whatever helps me take it down the field. If thoughtfulness or articulateness help, I use ’em, or if boorishness or… non… articulosity… help, then I use those. Sounds like quite a versatile toolkit, and a great way to approach the craft. So when you’re performing music for friends, are they generally more into hearing you do covers or Dale Henry originals? That depends on the situation. If it’s a “singin’ ’round the campfire” kind of thing, then people want to hear familiar songs. I do what I can, but being a music-hound, most of my covers are not universally known. I’m just not the best guy for that job. here, I’m going to get my guitar and sing you my new tune.” They’re used to that by now, and generally indulge me. performances, it’s almost exclusively originals, because I’m just not enough of a singer to add a lot to, you know, the Van Morrison version. You’ve been writing songs since you were a 13 year-old kid in middle school — what do you observe about how your songwriting has grown and matured as you have done the same as a person? singer. It was a completely private thing, almost no one even knew I wrote songs, and certainly no one heard any of them. As a teenager, it was a way to escape from my terrible loneliness and feel connected to something bigger than myself, that being the songs I heard on the radio and bought at the record store. At the same time, my tastes were developing, especially as I learned more about the roots of the music I loved, and began to feel a part of an important tradition. A huge leap for me was when I sought out a teacher, and I was lucky enough to find someone who got where I was coming from musically and really encouraged me, showing me what I needed to know to develop further. His name is Johnny Harper (nee Lumsdaine), a brilliant musician, scholar and educator — one of the real unheralded champions of American music, and I’ll plug him ’til the cows come home. I got to a point in my late 20s where I was comfortable enough with my musical direction and my chops to start exposing my music to more people, and that’s when a feedback loop started kicking in. I was finding out what worked for other people as well as for myself, and was learning how to both forge an identity as an artist as well as, in a limited way, start developing an audience. new in pretty much every song I write, whether it’s playing with rhyme scheme or harmonic progression or melody, etc. Maybe there is some kind of progression in the content of my songs, too. It would be natural as my understanding of the world and myself has supposedly deepened, that my songs would reflect that. Maybe they do. It’s not something I think about, beyond having a generally poor opinion of whatever I used to be doing and a generally overinflated opinion of what I’m doing now. I will say this: when something does come to me now, I can evaluate more quickly if it’s going to have the legs to end up being a worthwhile song, and I can take it from idea to a pretty reasonable song more reliably. Not more quickly – I work harder than ever to get a song right – but more reliably. One more question: what’s the most gratifying part of writing a new song? I guess it’s that first rush, when I get something and it starts coming together. That doesn’t always happen when I first get the germ of the song, sometimes not even in the first session. But when I’ve got a hook that I think is pretty cool and the chord progression is coming together and I can see the direction the verses have to take, that’s a pretty great feeling. I’d have to say that feeling is probably why I’ve kept doing it all these years. That’s usually when I tell my wife, “I wrote a new song!” although it will take hours more over the next few days before it’s really finished enough to play for her, and then many more hours over the next weeks or months polishing out the rough spots until I think it’s fit to play for strangers. process of applying rough chunks of material and then whittling them away, arduous as that process sometimes is. If I do my job right, I end up with something that resembles as closely as possible what that song wants to be. Great insights, Dale. Thanks so much — and keep that folk poetry flowing.